Head south back to your house and speak with your mother. The next few paragraphs are optional and cover some item collecting. If you'd rather, skip ahead and just go straight to the Marina to the south of Hau'Oli City. From your house, continue south to Ten Carat Hill (left of the lab) and use Tauros to break through the rocks blocking the path. Pick up the X Attack in the item ball near the entrance. 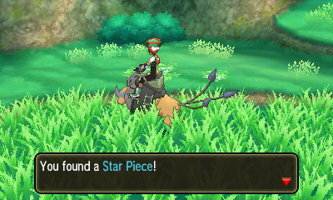 Continue breaking rocks with Tauros to the left and then hop off him to grab a Super Potion and Ultra Ball on a cliff. Continue breaking rocks to the left and exit the cave into Ten Carat Hollow. 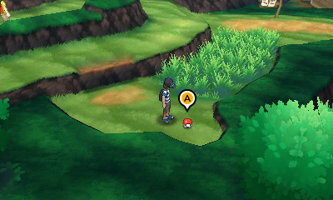 If you explore the grassy area here you can find a Hard Stone, a Nugget, a Burn Heal, and a Great Ball from Item Balls. There's also a Star Piece hidden in the grass in the north left area. Head right and south to find TM62 - Acrobatics. Head back south and exit Ten Carat Hill. 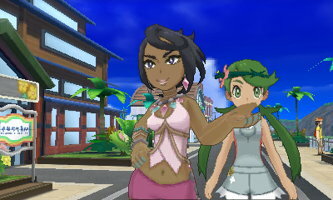 If you've got some time, this is a good opportunity to collect some goodies in Hau'Oli City. 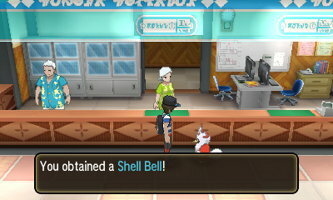 First, there is a Revive in an Item Ball south of the Pokemon Center. 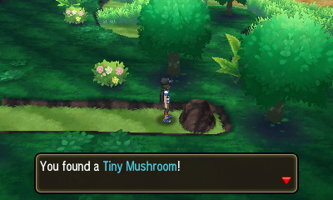 Next to City Hall you'll find a Tiny Mushroom. If you speak to the woman on a bench inside City Hall you'll get a Revive and if you speak to the lady in green behind the counter you'll get a Shell Bell. If you head to the left side of town you'll find an Ether next to a pool. If you enter the house next to the pool, you can speak to the woman in the kitchen for a Lumiose Galette. Go to the 2nd floor and speak to Ilima to challenge him to another battle. His Pokémon are a little stronger this time around (Lv. 15 Gumshoos and Lv. 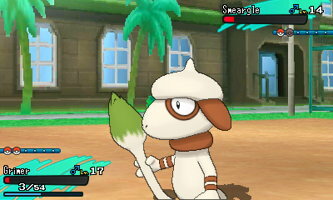 14 Smeargle, but he'll give you an Everstone if you can defeat him. After you've collected everything you're interested in, head right and south towards the Marina. Once you get to the Marina you'll run into Hau and Professor Kukui who will invite you to sail to the next island with them. You'll arrive in Heahea City on Akala Island. A cutscene will introduce Kahuna Olivia and Captain Mallow. Head right along the main street for some more dialogue with Lillie. The lady standing on the opposite side of the road as Lillie will give you a Rare Candy. Continue north towards Tide Song Hotel and you'll encounter Dexio and Sina. Sina will challenge you to battle against her Lv. 15 Delibird and Lv. 16 Glaceon. Dexio will give you the Zygarde Cube upon winning the battle. Continue north along the path and enter the Tide Song Hotel. Head to the back left corner to find a sparkling object on the floor. 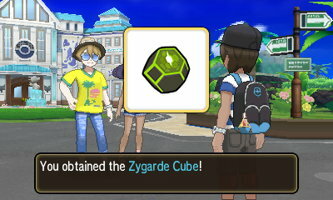 Examine it to get a Zygarde Cell sucked into your Zygarde Cube. Exit the hotel and head right onto Route 4. Battle the trainer at the beginning of the route and pick up the Great Ball to the right. A little further up and to the right is a Tiny Mushroom under a black rock. Further up the trail you'll see another Zygarde Cell. Head to the left for a Revive and to defeat a trainer. 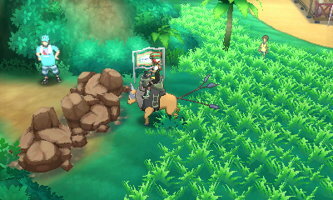 Continue to the right, defeating another trainer. You'll find an Adrenaline Orb in some tall grass to the south shortly after. Follow the path past another trainer and pick up an Energy Root to the south. Grab some berries from under the tree to the right, then head north into Paniola Town. 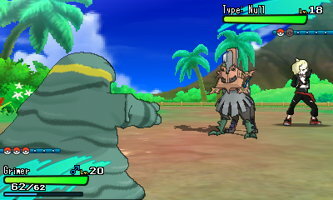 You'll meet up with Hau upon entering Paniola Town and he'll challenge you to another rival battle. He'll give you a Dire Hit when you defeat him. Heal up if you need to, then head north out of town to Paniola Ranch. Head right and defeat the trainer and then approach the farmer. 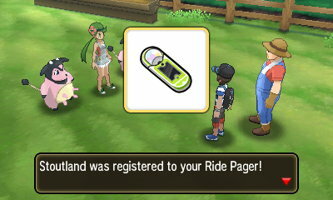 He'll bring you to Mallow, who will register Stoutland to your Ride Pager. Use Stoutland here to find a Repel, Fresh Water, and Moomoo Milk. Head south from here to battle a trainer and find an Ether. Head right and north to get to Route 5, picking up the Amulet Coin from a cranny and defeating a another trainer along the way. 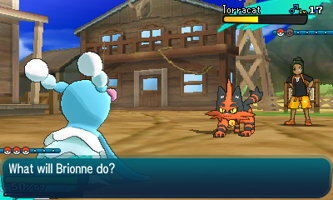 Upon entering the route you'll immediately face off against trainers in a double battle. Continue to the left to battle Gladion, who is fighting for Team Skull. He'll have a Zubat and his signature Pokémon, Type: Null. Hau will give you 3 Revives when you beat him. There's a Super Potion north of here next to another trainer. You can also go right onto the cliff to find TM41 - Torment. Continue to the left and beat the next set of double trainers and heal at the Pokemon Center. You can get a Dire Hit if you speak to the fisherman in the Pokemon Center. Go south and defeat the trainer here and collect the berries from under the tree. 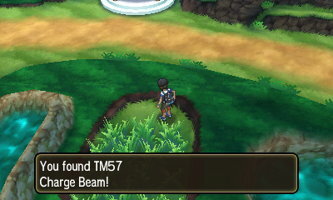 You can grab TM57 - Charge Beam from an inlet in the tall grass. Exit this area left of the Pokemon Center. You'll come accross a blue-haired girl named Lana. Follow her to the left and pick up the Net Ball along the way. Continue south and you'll run into Lana again. 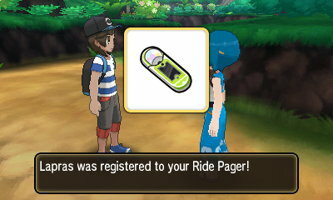 She'll add Lapras to your Ride Pager. You can head north and grab a X Sp. Atk. Then use Lapras to surf and investigate the splashes in the water. 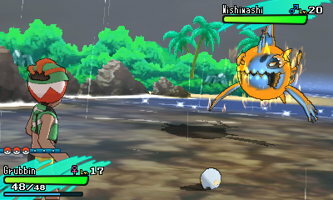 Defeat the Wishiwashi you find and then cotinue south, grabbing the Revive from the item ball on the shore. You'll come accross Lana again and she'll once again prompt you to investigate the splashes in the water. Defeat another Wishiwashi. You'll be prompted to investigate splashes a third time, this time leading into the Totem's Den. Before you do, exit the water to the right where you'll find TM55 - Scald. 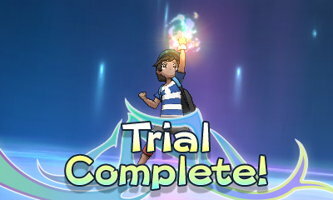 The next Island Trial - the Trial of Lana - will start. Make sure to pick up the Hyper Potion next to the gate. Just like before, go and investigate the splashes. 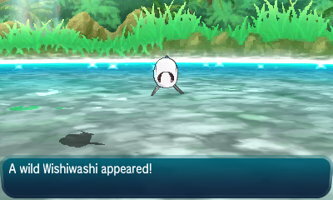 You'll find a Wishiwashi in schooling form. This is the Totem Pokemon. It can summon Alomomola to fight beside it, but it shouldn't give you too much trouble if you have a solid grass or electric type by now. After defeating the Totem Wishiwashi, head back to Captain Lana. She'll give you Waterium Z for your troubles and the trial will be complete. She'll also give you a Fishing Rod and 10 Dive Balls. You'll find yourself at the Pokemon Center when you finally regain control.